Today's small businesses are searching for cost-saving health coverage options. The Chamber is addressing this need by offering a new solution that can lead to more rate stability and offer potential savings for groups with 2 - 50 eligible employees. The Chambers have partnered with the Georgia Chamber of Commerce who has teamed up with Anthem Blue Cross and Blue Shield (Anthem) to administer the Georgia Chamber SMART Plan (SMART.) This plans allows small group (2-50) employers to join together and share in the overall claims risk. By being part of a larger, self-funded pool, employers have financial protection backed by Anthem. 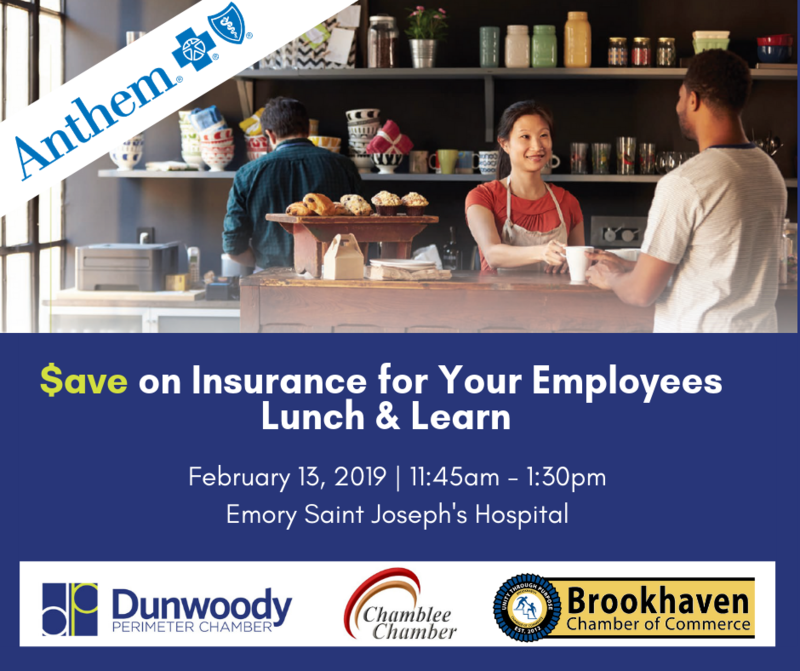 Join us on Feb. 13th from noon until 1:30 p.m.at Emory Saint Joseph's Hosptial to learn how you can take advantage of this great program and $ave. Representatives from Anthem will be on site to provide education and answer questions. Dunwoody Perimeter Chamber Board Member, Brent Morris with CBIZ, Inc., will also give an overview on how this program is saving real businesses real money. All brokers, chamber members and businesses who have 2 - 50 eligible employees are invited to attend. This event is a partnership between the Brookhaven, Chamblee and Dunwoody Perimeter Chambers of Commerce. There is no-cost to attend, however advanced registration is required. Lunch will be provided. Lunch & Program 12:00 noon - 1:30 p.m.
Use your email address to register.